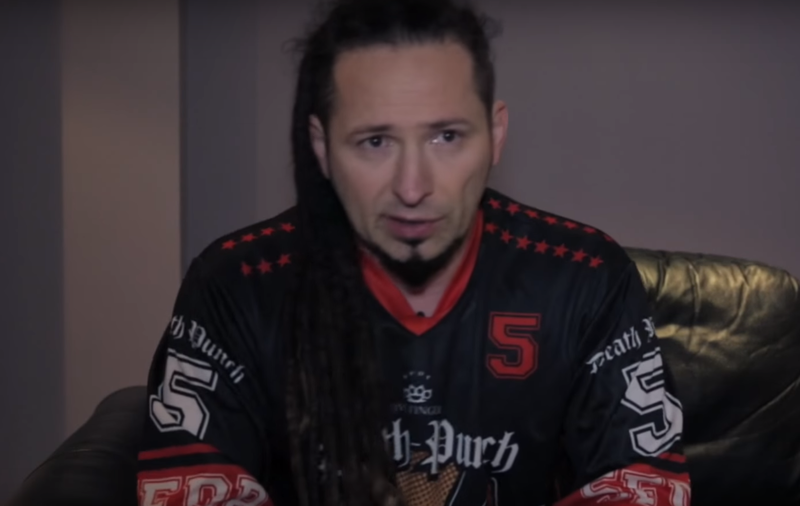 MetalRockNews: Five Finger Death Punch's Zoltan Bathory about terror threats: "Even if it's 90 percent safe, is that safe enough?" Five Finger Death Punch's Zoltan Bathory about terror threats: "Even if it's 90 percent safe, is that safe enough?" Five Finger Death Punch guitarist Zoltan Bathory was recently interviewed by Metal Hammer, you can read some excerpts below. About the band's decision to call off the Milan show, Bathory said: "The first moment when that happened, when our name popped up as a potential threat, at first I was… You try to make a joke [about it and say something like], 'C'mon, guys, our record wasn't that bad.' But there's nothing really funny about it. But it happened, actually, our name popped up. And it wasn't necessarily… The band wasn't the target. The situation was the target — that there's a crowd. It doesn't matter what band would have played that particular venue. And afer Paris, obviously, that was actually one of the venues we did worry about. We know that venue, we know the security, we know the ways in and ways out. And generally, the security there is pretty relaxed to begin with. So that's why it became a target. It's not because [of] the band; it was because it was another soft target. So, immediately, obviously, we talked with the local security, and then realized that they can't really provide the security we required for this. Then we said, 'We cannot put…' Even if it's 90 percent safe, is that safe enough? Would you put your fans or friends or whoever into… 'Yeah, most likely you'll survive.' No, you won't. It's a concert. You go there to…"
He continued: "I'm a thrill seeker; I put myself in danger all the time. But when regular people go to a concert, they wanna be entertained. They're not there to… 'Let's see if I survive.' That's absolutely crazy. That's absolutely insane. So, when we analyzed the situation and we knew that it is credible, credible enough… Anonymous groups are separate groups. One group can claim, 'We don't know.' The other one says, 'We know.' That's the power of Anonymous, that they are decentralized, smaller groups, cells, basically, and that is their security, that they operate that way. So one group can know something that the other is not necessarily aware of. So you have to take it seriously." Bathory also defended other band including Lamb Of God, Papa Roach, Foo Fighters and Deftones who chose to cancel their European tours in the wake of the Paris terror attacks. He said: "Again, would you wanna be the band…? I mean, I read Randy Blythe from Lamb Of God, his explanation, and there's not much to add to that. Would you be the band who were warned, were threatened, and you ignored it and you still did the show, and when something happens, then it's all your fault. So it's kind of like all these bands are in the 'I'm damned if I do it, I'm damned if I don't,' because if you don't do it, [people will say], 'Oh, those pussies.' And all you can do it is, like, look, I don't care about what these people… I can't care about… To some degree, I wanna shake your head, like, 'Jesus, man, can you understand what's going down here?' But you can't. So all we can do is be logical, be methodical, check out all the intel you get, analyze it, and be thorough with that." He continued: "Again, 90 percent good enough is not good enough, not for the fans, not for thousands and thousands of people. It's just not good enough. So any of the shows that we couldn't provide the security, or it wasn't on the level we required, we just [went], 'Okay, we're not gonna do those, 'cause we can't pull it [off].' Brussels, we couldn't even get in, so that was not even our choice at that point. But even if we could get in, that was already dicey. And I also have a crew… Again, back to the same thing. I have to ask these guys to go… The sound guy and the light guy and the merch guy, they're out there with their backs to the door. I have to ask my sound engineer to sit there. If I can't promise him an absolute 100 percent safety, how can I ask him to do that? Or any band… Papa Roach, Lamb Of God, how can they possibly ask their crew to sit out there after we all lost people we knew and we were friends with in Paris? How can I ask them, like, 'Hey, is it your turn to sit down there and chance it?' No. it has to be a hundred percent."